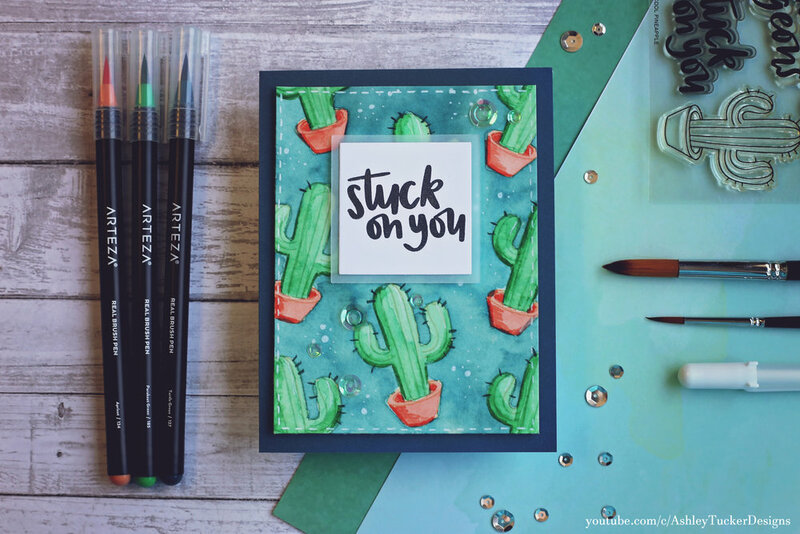 For today's card I used the stamp set from Simon Says Stamp's July card kid my Arteza Real Brush Pens. 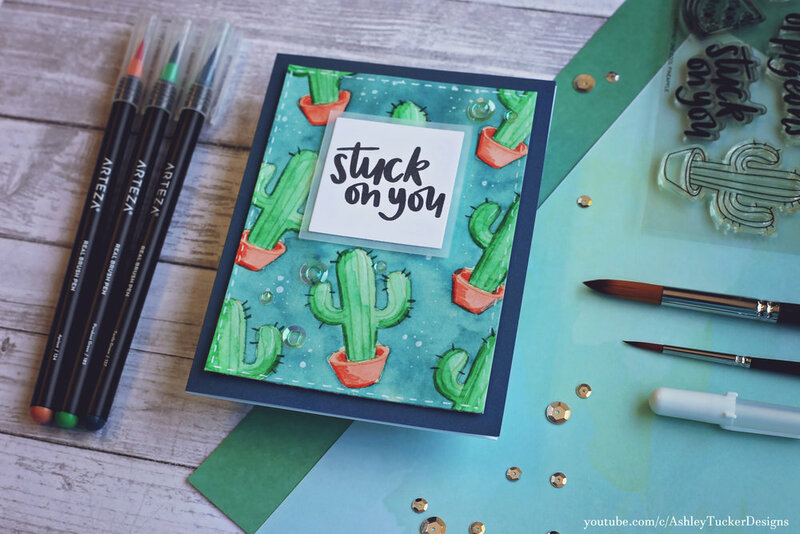 I started by stamping the cactus image repeatedly on a piece of Canson watercolor paper with Antique Linen Distress Ink. I used the Distress Ink because I was going for a no-line watercoloring look. Normally when I used my Arteza markers I color with them directly on my paper and then blend it out with water. 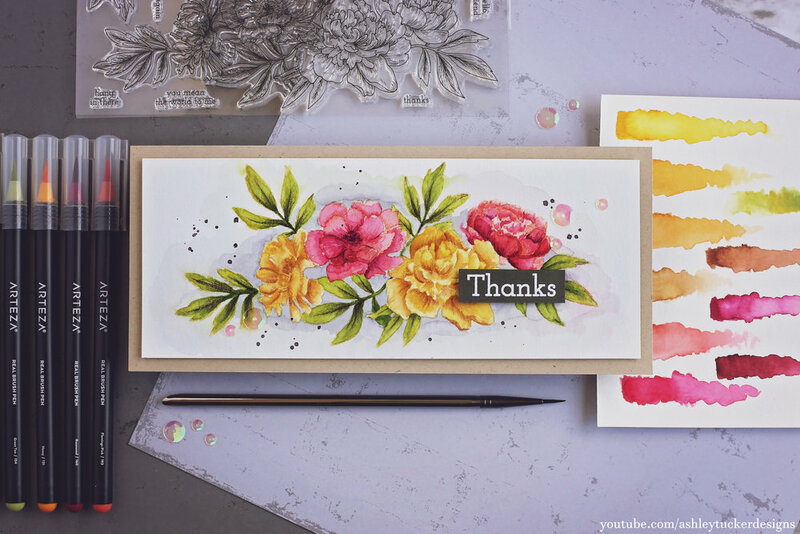 For this card I used my Arteza markers on a palette and then picked up that pigment with a brush to paint with it. The palette that I used was just a piece of cardstock that I laminated. Once I finished with the watercoloring I added some dots to the background with my white gel pen. I already added dashed lines around the edge. For today's card I used Antique Linen Distress Ink, Kuretake Gansai Tambi Watercolors, Canson watercolor paper, and a daisy stamp from the Stampendous stamp set "Daisy Thanks." See below for the giveaway winners from last weeks 500 Subscriber Giveaway! I decided right away that I wanted this card to be a longer rectangle shape, so I cut my Canson watercolor paper to be 4x8, though I would eventually trim this down a little once the painting it all finished. I stamped the daisy stamp using Antique Linen Distress Ink because I was going for a no-line watercolor look. The Antique Linen color is very light and because Distress Ink reactivates with water the lines will fade when I watercolor the images. I just purchased a 36 set of Kuretake Gansai Watercolors. They were on sale on Amazon and I could pass them up. They are so much higher quality than the watercolors that I am used to and I already am in love with them. I am considering buying a higher quality brush now that I have these. It took me a long time to paint the daisies, mostly because it was my first time using these paints. I do think that I need more practice, but I am still really pleased with the results. I decided to use a kraft card stock base for this card. I used a lot of foam tape to adhere the watercolor piece to the card base. Using lots of foam tape really helps when there has been some warping from the painting process. To finish this card I added some clear sequins, some pink half pearls, and I drew a dashed line around the boarder with a white gel pen.